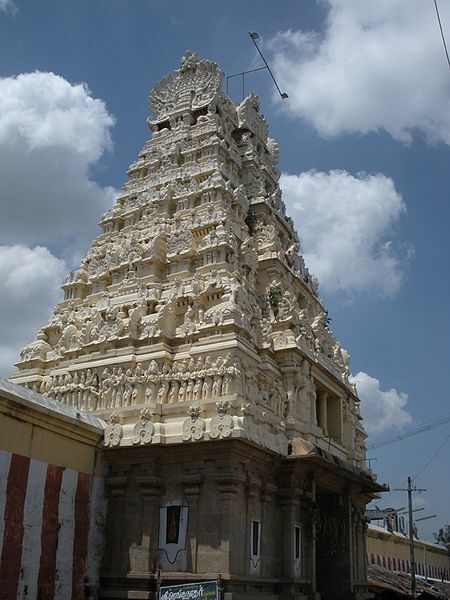 Located within Tiruchirapalli city in central Tamil Nadu, India, this temple is one of the 108 Sri Vaishnava Divya Desams and also the birthplace of Sri Thiruppan Azhwar, one of the twelve Azhwars. A very compact temple, it houses separate sannidhis for Sri Thiruppan Azhwar, Sri NammAzhwar, Sri Vishvaksenar and Sri Raamanujar. Since Uraiyur is part of Tiruchirapalli [Trichy for short] city, it is easily accessible. The name Thirukkozhi is virtually unheard of today, and the place is referred to as Uraiyur or Nachiyar Koil by local people. Visitors may stay at Trichy and cover Uraiyur along with other Divya Desams in and around Trichy, which include Sri Rangam, Thiruvellarai, Uthamar Koil, Thiru Anbil and Koviladai [a.k.a Thiruppaer Nagar]. From within Trichy city, Uraiyur can be reached by public transport buses or auto. Those who wish to cover all the six Divya Desams in and around Trichy can hire call-taxis and cover all the Divya Desams in 1-2 days. 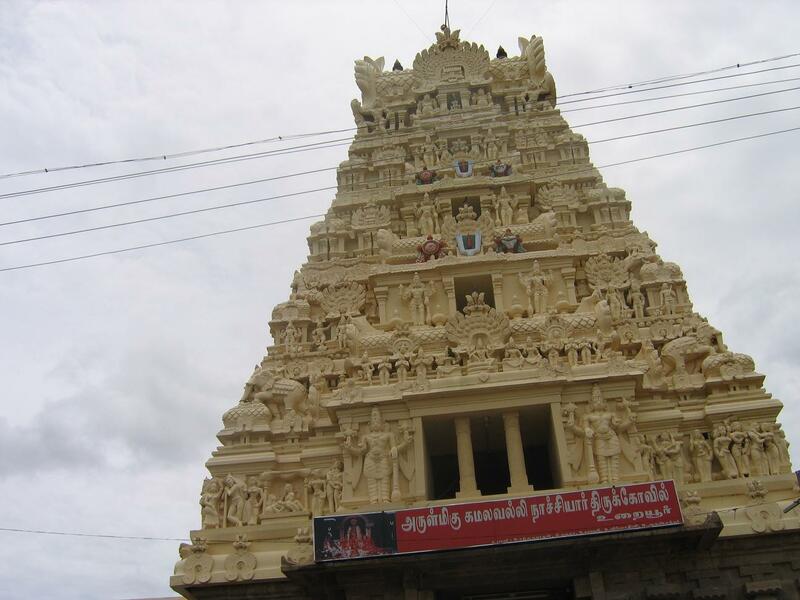 Sri Kamalavalli Thayar is said to have incarnated as the daughter of the local Chozha king and later married Sri Perumal. The Chozha king built the temple to commemorate the divine wedding. Hence Perumal is known as Azhagiya MaNavALan which literally means “The handsome bridegroom”. On the day preceding Pankuni Uthiram, the uthsavar of Sri Ranganatha [NamperumaL] is brought from Sri Rangam and a Kalyana Uthsavam is celebrated with the Thayar here. 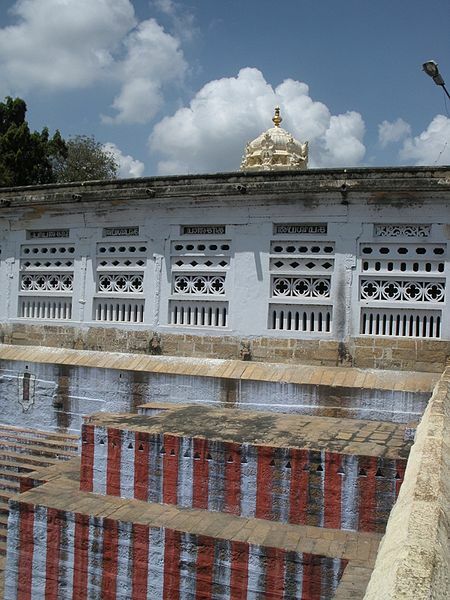 Since ThayAr has a lot of importance here, the temple is referred to as “Nachiyar Koil” by local people. Historically, Uraiyur was the capital of the Chozha kings at one point of time. Later the Chozhas shifted their capital to Pazhaiyarai near Kumbakonam and then later to Thanjavur. Once upon a time, there was a discussion among the great rishis that among Trimurthies, who is the greatest. But in that discussion also, they could not come to a conclusion that who is great amongst the Trinity. Finally, all the rishis thought it would be helpful for them to find the answer for this if they could get the sugesstion from the great muni, Brighu. They all explained about the discussion they had among them and said he is the right person to find a solution for this and clear their doubts of what is there in their minds. Brighu muni also accepted their word and told them he would give an answer that would clear all of their doubts. First, he went to Kailasam where Lord Shiva and Goddess Parvathi reside. But, in the entrance itself, Brighu muni was stopped by the Dwara Balakaas as the residing deities are all alone and doesnt want them to get disturbed. As he got this kind of answer in Kailash, he thought he could not be the right person who might help his devotees as ha was not easy to talk with. As he was disappointed by this activity, he then left to Sathya Lokam where Lord Brahma and Godess Saraswathi reside. There also he could not meet Brahma devan and he began to think what he thought when he went to Kailasam. Finally, he went to Sri Vaikuntam where Sriman Narayanan and Godess Sri Laksmi reside. As Brighu muni enetered Vaikuntam, he was greeted in a good manner and this first action made him to think that Sriman Narayanan is the right person to whom all persons and rishis can seek help and can have a direct approach towards him. Sriman Narayanan offered him with the seat and did the Paadha Pooja for him. But this action of Sri Vishnu made Sri Lakshmi to think bad and asked Him not to catch hold of his feet. But, this action of Sri Lakshmi made Brighu muni to get angry and cursed Her that she would born in the world as an ordinary human. But Sri Lakshmi felt very sad for the Curse she got from Brighu muni but Sriman Narayanan said that all the actions are happening according to their fates only and added that he will follow Her soon towards the earth. 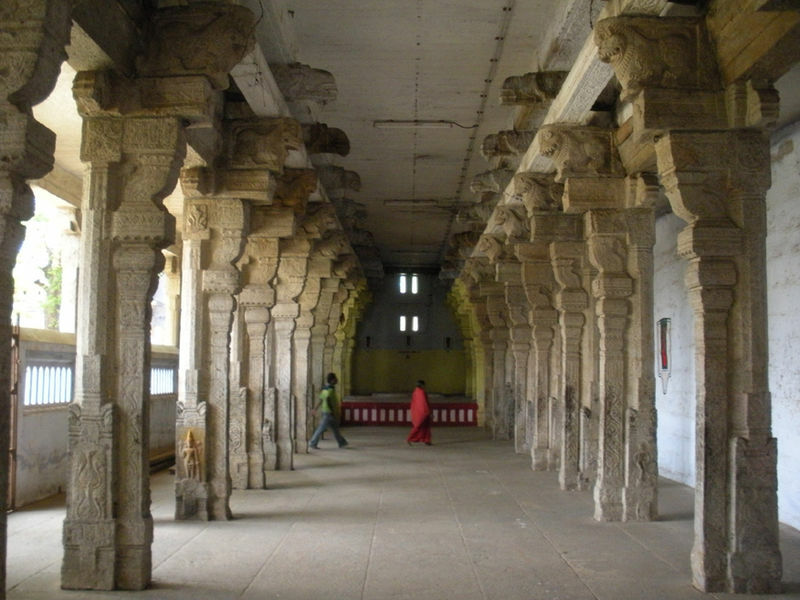 At the same time in the earth, a king by named Dharma Varman lived in Kumbakonam, Chozha Naadu. Once he went out for hunting and found that the rishis were being distressed by some demons and sought help from the king. Dharma Varman said that he will help them from the demons by killing them and he stayed in the forest for sometime. The King was happy for all the reason but only one thing made him worry and disappoint and that is he had no children. He seeked the help of the rishis to hep him out to get a child. So, to help the king, all the rishis did a Yagam to get a child for the king. At that time, an Asareeri stated that if he want to get a child he should pray towards Sri Lakshmi and as a result, Sri Lakshmi itself will be born as a child to him. Hearing this, he started to pray towards Sri Lakshmi and finally, a female child was born to him and was kept a name as “Vara Lakshmi”. As the days went on, Dharma Varman started to seek a perfect groom for his daughter and announced a Swayamvaram for that. Lots of kings came for this and at the same time, Sriman Narayanan also came there as one among the grooms. In that hall, when Sri Lakshmi came, she had a look at all the members in the hall and at the same time, she also noticed Sriman Narayanan and went straight towards Him without any delay and Garlanded him. All the persons saw this wedding of Sri Vishnu and Sri Lakshmi and the king raised a temple for Sri Ranganathar in Kalyana Thirukkolam. 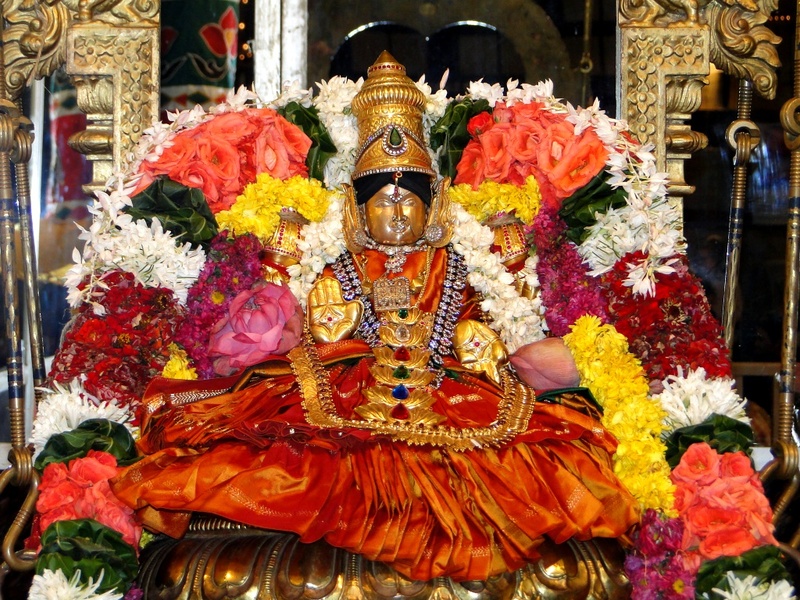 In this sthalam, Periya Pirattiyar is giving her seva in two different ways. One is Irundha seva and the other one is Kidantha seva. Combining these both sevas, she is giving the seva “Urayum” [from sitting seva to sleeping seva] seva, this temple is called “Thiru Urayoor”. 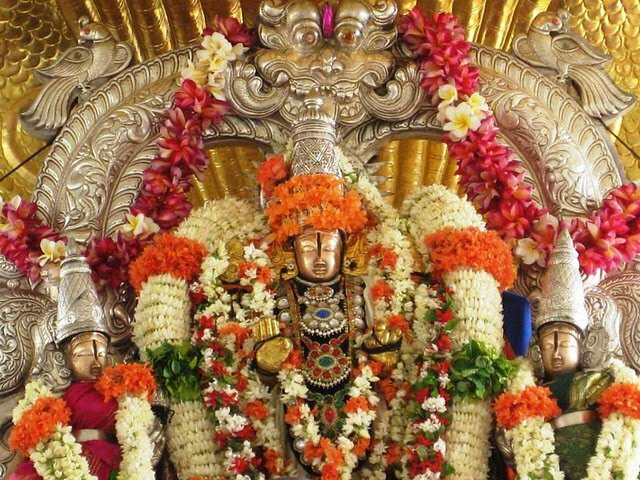 The Utsavam done here starts on Aayilya Nakshathiram in Panguni month that lasts for 10 days. On the first day of Panguni Uthiram, Sri Ranganathar comes from Sri Rangam and stay in Urayoor. And on Panguni Uthiram, he marries Kamalavalli Naachiyar and give his Kalyana Kola Seva to his Bhakthas. Only Moolavar is found in this sthalam. There is no Utsavar here. Since Arangan married Kamalavalli Naachiyaar, Utsavar of Srirangam is said to be the Utsavar for this Thirukkozhi sthalam too. There is no Brahmotsavam conducted in this divya desam. Devotees pray for unity among the couples. The Vimanam is Kalyana Vimanam. 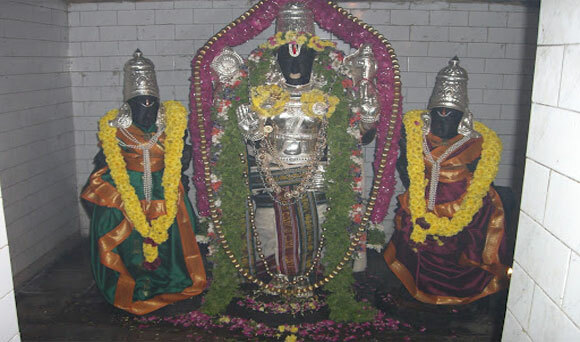 Moolavar: The Moolavar of this Sthalam is Sri Azhagiya Manavaalan. Srirangam Uthsavar, Namperumal, gets the name Sri Azhagiya Manavalan when he comes to Uraiyur. He is found in Standing position (Nindra thirukkolam), facing his thirumugham towards North direction along with “Prayoga Chakkaram”. Prakthyaksham for Ravidharman and all Devars [330 crores]. Thayaar: The Thayaar of this Sthalam is Sri Kamalavalli Naachiyaar [Vaasakshmi]. Also named as “Uraiyur Valli”. She is found in Sitting position[Veetrirundha Kolam] facing North direction. The Position of the Thaayar is similar to position of a Bride who sits along with the Groom during marriage. Uthsavar Thaayaar: Sri Kamalavalli Naachiyaar [Sri Vaasa Lakshmi] and Thaayar Thirunakshatram – Aayilyam [Panguni]. The above positions are called as “Thirukalyana Avasaram”. The temple is open from 6.00 a.m. to 12.00 a.m. and from 5.00 p.m. to 8.00 p.m. Phone: 0431-2762 446 ; 94431 88716. Vivid description and details of the temple . The photographs are very good. Excellent work. God bless you.